Take an exotic boat ride with your own personal guide to see the nearby Tropical Rainforest of Tortuguero National Park. Enjoy the abundant jungle wildlife all around the grounds of the lodge. Take a stroll through the grounds and enjoy a variety of colorful plants and flowers. Take a river cruise through the jungle. Go on a turtle excursion (seasonal). 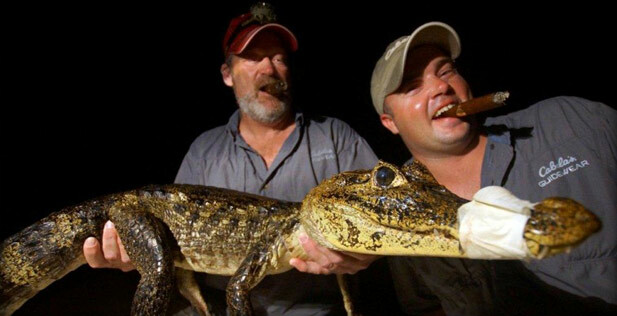 Catch a crocodile on one of our Night Crocodile Tours. See the black volcanic sand beach or go surf fishing. Do some bird or butterfly watching. Ask us about taking a Banana Plantation Tour. Sit on the verandah in a rocking chair and take in the beautiful surroundings and listen to the sounds of nature. Lounge in the dining hall and enjoy swapping fishing stories and the open bar. Or just relax and enjoy the hammocks, swimming pool and Jacuzzi. Consider spending an extra day or two in San Jose and do some zip-lining through the jungle canopy. See the volcanos and go shopping for some handmade gifts made by the local craftsmen. Visit a coffee plantation and enjoy a ride through the Costa Rican mountains. A “must-see” is the La Paz Waterfall Gardens Nature Park and Wildlife Refuge, with its spectacular waterfalls, beautiful gardens, and large collection of wildlife.